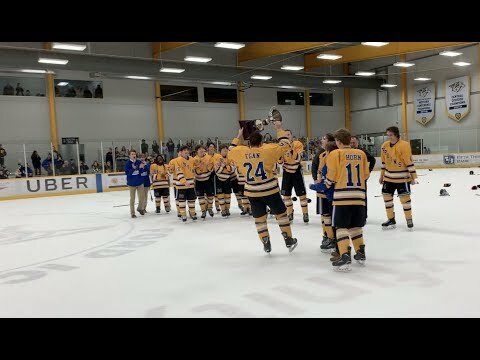 The Brentwood Bruins went head to head against Centennial-Page at Ford Ice Center for the GNASH season opener on Monday night. With the Bruins coming into the season with high expectations with the talent that premiered on their team, their expectations were met, capturing the win 7-4 against Centennial Page. Bruins coach Chris Orem expected the win out of his team. During the second period however, backchecking became a large issue for the Bruins, causing four break away attempts by Centennial-Page. Freshman Chloe Kamssu made the varsity Brentwood team while playing with a AAA travel team. She has managed this all while being one grade year ahead than her birth year, meaning Kamssu should still be in middle school. Kamssu has been looked at by several college coaches already with high hopes of Kamssu potentially signing a letter of intent. Chloe Kamssu will be the player to watch over the next few years. That is a fact. Captain Brennen Williams was excited to be back and playing hockey for his fourth year with the Brentwood Bruins. Williams is hoping to go to win their next game against Blackman-Stewarts Creek on the 25th to build to the season. When Williams was asked about college hockey, he said that he had gotten into the University of Pittsburgh with the hope of playing on their ACHA Division I team. The Brentwood Bruins have others as well that are looking to play college hockey with the hope that this year sets a standard on how they should be playing. Centennial-Page coach Mike Barns understands that while wins are expected, there is other work to be done to improve the team overall. The captain of Centennial-Page, Brandon Seymour, has been looking into the possibility of playing college hockey, keeping his option open. He mentioned looking at Ole Miss as well as the University of Tennessee at Knoxville if he decides to continue his hockey career. When asked about what it was like to be a captain of a team that involves to different schools, he responded that he is excited about bringing together two different schools and two different groups of people together and bonding as a team. Page High School, up until last year, was tied with Hume-Fogg Academic as a team. When asked if there was going to be any rivalry, Seymour stated that he did not think there would be any rivalry. All in all, both teams are looking forward to this upcoming season, one team already riding on their first win, another team taking what they can from their first loss to push forward. Brentwood plays again on the 28th at Centennial Sportsplex against Blackman-Stewarts Creek while Centennial-Page plays again on the 30th against Mount Juliet at Centennial Sportsplex. Best of luck in the season to both teams. Editor’s note: If we have incorrectly misspelled a player’s name, please let us know in the comments section below. Covering high school hockey is new and resources are limited, so we want to get it right!